Elephant birds are members of the extinct family Aepyornithidae. Elephant birds were large to enormous flightless birds that once lived on the island of Madagascar. They became extinct, probably in the 17th or 18th century, for reasons that are unclear, although human activity is the suspected cause. Elephant birds comprised the genera Mullerornis and Aepyornis. Aepyornis was among the heaviest of birds (the extinct Dromornis stirtoni of Australia reached a similar weight). While they were in close geographical proximity to the ostrich, elephant birds' closest living relatives are kiwis, suggesting that ratites did not diversify by vicariance during the breakup of Gondwana but instead evolved from ancestors that dispersed more recently by flying. Size of Aepyornis maximus (centre, in purple) compared to a human, an ostrich (second from right, in maroon), and some non-avian theropod dinosaurs. Grid spacings are 1.0 m.
The elephant birds, which were giant ratites native to Madagascar, have been extinct since at least the 17th century. Étienne de Flacourt, a French governor of Madagascar in the 1640s and 1650s, mentions an ostrich-like bird said to inhabit unpopulated regions. In 1659, Flacourt wrote: "vouropatra – a large bird which haunts the Ampatres and lays eggs like the ostriches; so that the people of these places may not take it, it seeks the most lonely places." Marco Polo also mentioned hearing stories of very large birds during his journey to the East during the late 13th century. These accounts are today believed to describe elephant birds. Aepyornis, believed to have been more than 3 m (9.8 ft) tall and weighing perhaps in the range of 350 to 500 kg (770 to 1,100 lb), was at the time the world's largest bird. Only the much older species Dromornis stirtoni from Australia is known to rival it in size among the fossil record and is reported to have shared the same estimated upper weight, 500 kg (1,100 lb). Remains of Aepyornis adults and eggs have been found; in some cases the eggs have a circumference of more than 1 m (3.3 ft) and a length up to 34 cm (13 in), the largest type of bird egg ever found. The egg weighed about 10 kg (22 lb). The egg volume is about 160 times greater than that of a chicken egg. Four species are usually accepted in the genus Aepyornis today, but the validity of some is disputed, with numerous authors treating them all in just one species, A. maximus. Up to three species are generally included in Mullerornis. Aepyornis maximus is commonly known as the 'elephant bird', a term that apparently originated from Marco Polo's account of the rukh in 1298, although he was apparently referring to an eagle-like bird strong enough to "seize an elephant with its talons". Sightings of eggs of elephant birds by sailors (e.g. text on the Fra Mauro map of 1467-69, if not attributable to ostriches) could also have been erroneously attributed to a giant raptor from Madagascar. The legend of the roc could also have originated from sightings of such a giant subfossil eagle related to the African crowned eagle, which has been described in the genus Stephanoaetus from Madagascar, being large enough to carry off large primates; today, lemurs still retain a fear of aerial predators such as these. Another might be the perception of ratites retaining neotenic features and thus being mistaken for enormous chicks of a presumably more massive bird. The ancient Malagasy name for the bird is vorompatra, meaning "bird of the Ampatres". The Ampatres are today known as the Androy region of southern Madagascar. Like the ostrich, rhea, cassowary, emu, kiwi and extinct moa, Mullerornis and Aepyornis were ratites; they could not fly, and their breast bones had no keel. Because Madagascar and Africa separated before the ratite lineage arose, Aepyornis has been thought to have dispersed and become flightless and gigantic in situ. More recently, it has been deduced from DNA sequence comparisons that the closest living relatives of elephant birds are New Zealand kiwis. 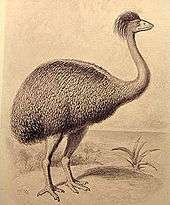 Elephant birds are actually part of the mid-Cenozoic Australian ratite radiation; their ancestors flew across the Indian Ocean well after Gondwana broke apart. The existence of possible flying palaeognaths in the Miocene such as Proapteryx further supports the view that ratites did not diversify in response to vicariance. Gondwana broke apart in the Cretaceous and their phylogenetic tree does not match the process of continental drift. Life restoration of the proto-kiwi Proapteryx micromeros. The last common ancestor between elephant birds and kiwis would have been a flying species similar to it. Claims of findings of "aepyornithid" egg remains on the eastern Canary Islands, if valid, would represent a major biogeographical enigma. These islands are not thought to have been connected to mainland Africa when elephant birds were alive. There is no indication that elephant birds evolved outside Madagascar, and today, the Canary Island eggshells are considered to belong to extinct North African birds that may not have been ratites (possibly Eremopezus/Psammornis, or even Pelagornithidae, prehistoric seabirds of immense size). 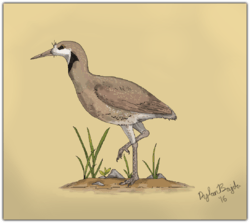 Two whole eggs have been found in dune deposits in southern Western Australia, one in the 1930s (the Scott River egg) and one in 1992 (the Cervantes egg); both have been identified as Aepyornis maximus rather than Genyornis. It is hypothesized that the eggs floated from Madagascar to Australia on the Antarctic Circumpolar Current. Evidence supporting this is the finding of two fresh penguin eggs that washed ashore on Western Australia but originated in the Kerguelen Islands, and an ostrich (Struthio camelus) egg found floating in the Timor Sea in the early 1990s. Because there is no rainforest fossil record in Madagascar, it is not known for certain if there were species adapted to dense forest dwelling, like the cassowary in Australia and New Guinea today. However, some rainforest fruits with thick, highly sculptured endocarps, such as that of the currently undispersed and highly threatened forest coconut palm Voanioala gerardii, may have been adapted for passage through ratite guts, and the fruit of some palm species are indeed dark bluish purple (e.g. Ravenea louvelii and Satranala decussilvae), just like many cassowary-dispersed fruits. Occasionally subfossil eggs are found intact. The National Geographic Society in Washington holds a specimen of an Aepyornis egg which was given to Luis Marden in 1967. The specimen is intact and contains the skeleton of the unhatched bird. The Denver Museum of Nature and Science (Denver, Colorado) holds two intact eggs, one of which is currently on display. Another giant Aepyornis egg is on display at the Harvard Museum of Natural History in Cambridge, MA. A cast of the egg is preserved at the Grant Museum of Zoology at London University. David Attenborough owns an almost complete eggshell, dating from 600–700 CE, which he pieced together from fragments that were given to him while making his 1961 BBC series Zoo Quest to Madagascar. In March 2011, the BBC broadcast the 60-minute documentary Attenborough and the Giant Egg, presented by Attenborough, about his personal scientific quest to discover the secrets of the elephant bird and its egg. There is also an intact specimen of an elephant bird's egg (contrasted with the eggs from other bird species, including a hummingbird's) on display at the Delaware Museum of Natural History, just outside Wilmington, Delaware, USA, and another in the Natural History Museum, London. The Melbourne Museum has two Aepyornis eggs. The first was acquired for £100 by Professor Frederick McCoy in June 1862, and is an intact example. In 1950 it was subjected to radiological examination, which revealed no traces of embryonic material. A second, side-blown Aepyornis egg was acquired at a later date. The Western Foundation of Vertebrate Zoology, with one of the world's largest collections of avian eggs, has seven Aepyornis egg specimens. A specimen is also held by the science department at Stowe School in Buckinghamshire, UK. In the collections of the department of geology at the Field Museum of Natural History in Chicago there is a complete, side-blown egg collected, in about 1917, by Rev. Peter A. Bjelde. In April 2013 a specimen was sold at Christie's in London for £66,675 The pre-sale estimate had been "more than $45,000". It is widely believed that the extinction of Aepyornis was a result of human activity. The birds were initially widespread, occurring from the northern to the southern tip of Madagascar. One theory states that humans hunted the elephant birds to extinction in a very short time for such a large landmass (the Blitzkrieg hypothesis). There is indeed evidence that they were hunted and their preferred habitats destroyed. Their eggs may have been particularly vulnerable. A recent archaeological study found remains of eggshells among the remains of human fires, suggesting that the eggs regularly provided meals for entire families. The exact time period when they died out is also not certain; tales of these giant birds may have persisted for centuries in folk memory. There is archaeological evidence of Aepyornis from a radiocarbon-dated bone at 1880 ± 70 BP (approximately 120 CE) with signs of butchering, and on the basis of radiocarbon dating of shells, about 1000 BP (approximately 1000 CE). An alternative theory is that the extinction was a secondary effect of human impact resulting from transfer of hyperdiseases from human commensals such as chickens and guineafowl. The bones of these domesticated fowl have been found in subfossil sites in the island (MacPhee and Marx, 1997: 188), such as Ambolisatra (Madagascar), where Mullerornis sp. and Aepyornis maximus have been reported. Also reported by these authors, ratite remains have been found in west and south west Madagascar, at Belo-sur-Mer (A. medius, Mullerornis rudis), Bemafandry (M. agilis) and Lamboharana (Mullerornis sp.). The rukh is known from Sindbad the Sailor's encounter with one in "One Thousand and One Nights". Some scholars think the roc is a distorted account of Aepyornis. Historical evidence for this can be found in Megiser (1623). H. G. Wells wrote a short story entitled Aepyornis Island (1894) about the bird. It was first collected in The Stolen Bacillus and Other Incidents (1895). 1 2 Mitchell, K. J.; Llamas, B.; Soubrier, J.; Rawlence, N. J.; Worthy, T. H.; Wood, J.; Lee, M. S. Y.; Cooper, A. (2014-05-23). "Ancient DNA reveals elephant birds and kiwi are sister taxa and clarifies ratite bird evolution". Science. 344 (6186): 898–900. doi:10.1126/science.1251981. PMID 24855267. ↑ "BBC Nature - Elephant birds videos, news and facts". bbc.co.uk. October 2014. Retrieved 2015-04-10. ↑ Etienne de Flacourt (1658). Histoire de la grande isle Madagascar. chez Alexandre Lesselin. p. 165. Retrieved 21 May 2013. ↑ Alexander, R. M. (1998). All-time giants: the largest animals and their problems. Palaeontology, 41(6), 1231-1245. ↑ Anderson, J. F., Rahn, H., & Prange, H. D. (1979). Scaling of supportive tissue mass. Quarterly Review of Biology, 139-148. ↑ Alvarenga, H. M., & Höfling, E. (2003). Systematic revision of the Phorusrhacidae (Aves: Ralliformes). Papéis Avulsos de Zoologia (São Paulo), 43(4), 55-91. ↑ Deeming, D. C., & Birchard, G. F. (2009). Why were extinct gigantic birds so small?. Avian Biology Research, 1(4), 187-194. ↑ Spotila, J. R., Weinheimer, C. J., & Paganelli, C. V. (1981). Shell resistance and evaporative water loss from bird eggs: effects of wind speed and egg size. Physiological zoology, 195-202. ↑ Julian P. Hume; Michael Walters (2012). Extinct birds. T&AD Poyser. p. 544. ISBN 1408158612. ↑ Long, J. A.; Vickers-Rich, P.; Hirsch, K.; Bray, E.; Tuniz, C. (1998). "The Cervantes egg: an early Malagasy tourist to Australia" (PDF). Records of the Western Australian Museum. 19 (Part 1): 39–46. Retrieved 2014-04-24. 1 2 Attenborough and the Giant Egg. 2011-03-02. BBC. Retrieved 2015-06-16. ↑ Data accessed through ORNIS data portal (http://ornisnet.org) on 7 January 2013: Western Foundation of Vertebrate Zoology. 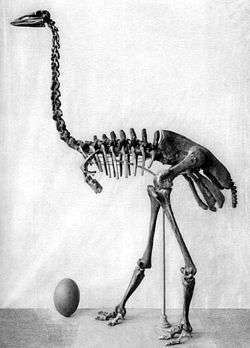 ↑ "Egg laid by extinct elephant bird sells for $101G at British auction". Associated Press. 24 April 2013. Retrieved 24 April 2013. ↑ Brett Line (April 1, 2013). "Elephant Bird Egg Auction Inspires a Hunt". National Geographic News. Retrieved 16 June 2015. "One minute world news". BBC News. 2009-03-25. Retrieved Mar 26, 2009. Presenter: David Attenborough; Director: Sally Thomson; Producer: Sally Thomson; Executive Producer: Michael Gunton (March 2, 2011). BBC-2 Presents: Attenborough and the Giant Egg. BBC. BBC Two. Brands, Sheila J. (1989). "The Taxonomicon : Taxon: Order Aepyornithiformes". Zwaag, Netherlands: Universal Taxonomic Services. Retrieved 21 Jan 2010. Brands(a), Sheila (Aug 14, 2008). "Systema Naturae 2000 / Classification, Genus Aepyornis". Project: The Taxonomicon. Retrieved Feb 4, 2009.
Cooper, A.; Lalueza-Fox, C.; Anderson, S.; Rambaut, A.; Austin, J.; Ward, R. (2001-02-08). "Complete Mitochondrial Genome Sequences of Two Extinct Moas Clarify Ratite Evolution". Nature. 409 (6821): 704–707. doi:10.1038/35055536. PMID 11217857. Davies, S. J. J. F. (2003). "Elephant birds". In Hutchins, Michael. Grzimek's Animal Life Encyclopedia. 8 Birds I Tinamous and Ratites to Hoatzins (2 ed.). Farmington Hills, MI: Gale Group. pp. 103–104. ISBN 0-7876-5784-0. Dransfield, John; Beentje, Henk (1995). The Palms of Madagascar. Kew, Victoria, Australia: Royal Botanic Gardens. ISBN 0-947643-82-6. Flacourt, Etienne de. ; Allibert, Claude (2007). Histoire de la grande île de Madagascar (in French). Paris, FR: Karthala. ISBN 2-84586-582-1. Goodman, S. M.; Rakotozafy, L. M. A. (1997). "Subfossil birds from coastal sites in western and southwestern Madagascar". In Goodman, S. M.; Patterson, B. D. Natural Change and Human Impact in Madagascar. Washington, DC: Smithsonian Institution Press. pp. 257–279. ISBN 1-56098-683-2. Hawkins, A. F. A.; Goodman, S. M. (2003). Goodman, S. M.; Benstead, J. P., eds. The Natural History of Madagascar. University of Chicago Press. pp. 1026–1029. ISBN 0-226-30307-1. Hay, W. W.; DeConto, R. M.; Wold, C. N.; Wilson, K. M.; Voigt, S. (1999). "Alternative global Cretaceous paleogeography". In Barrera, E.; Johnson, C. C. Evolution of the Cretaceous Ocean Climate System. Boulder, CO: Geological Society of America. pp. 1–47. ISBN 0-8137-2332-9. LePage, Dennis (2008). "Aepyornithidae". Avibase, the World Bird Database. Retrieved 4 Feb 2009. MacPhee, R. D. E.; Marx, P. A. (1997). "The 40,000 year plague: humans, hyperdisease, and first-contact extinctions". In Goodman, S. M.; Patterson, B. D. Natural Change and Human Impact in Madagascar. Washington DC: Smithsonian Institution Press. pp. 169–217. Megiser, H. (1623). Warhafftige ... so wol Historische als Chorographische Beschreibung der ... Insul Madagascar, sonsten S. Laurentii genandt (etc.). Leipzig: Groß. Pearson, Mike Parker; Godden, K. (2002). In search of the Red Slave: Shipwreck and Captivity in Madagascar. Stroud, Gloucestershire: The History Press. ISBN 0-7509-2938-3. Sauer, E. G. Franz; Rothe, Peter (1972-04-07). "Ratite Eggshells from Lanzarote, Canary Islands". Science. AAAS. 176 (4030): 43–45. doi:10.1126/science.176.4030.43. Retrieved 2011-03-05.
van Tuinen, Marcel; Sibley, Charles G.; Hedges, S. Blair (1998). "Phylogeny and Biogeography of Ratite Birds Inferred from DNA Sequences of the Mitochondrial Ribosomal Genes" (PDF). Molecular Biology and Evolution. 15 (4): 370–376. doi:10.1093/oxfordjournals.molbev.a025933. PMID 9549088.